Towtector is a brush system designed to protect campers, boats, trailers and all other towables from damaging road debris. If you own a trailer or boat you know that the road is not always a friendly place. Rocks can kick up damaging the front end of your boat or trailer. 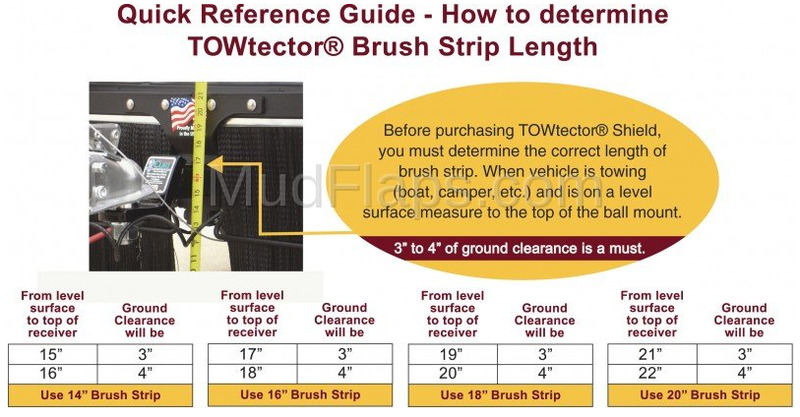 For this reason the Towtector brush system was created for Trucks, SUVs, Motorhomes & RVs. There are three widths of Towtector's to fit each of these vehicle types. The brush system is full customizable giving you the option of chrome, aluminum or steel frames for your brushes. Also, the Towtector system comes with different height brushes making it easy for you to customize your truck with the perfect fitting system. Traditional mudflaps are made to prevent damage to the vehicle they are mounted on. However they are not made to stop road damage to campers, boats, trailers and other towables. The Towtector brush system covers the entire rear of your truck so rocks and debris cannot hit your towables. The Towtector system is a small price to pay to prevent major damage and annoying dents in your boat or trailer! To see a video of the Towtector in motion at 65 mph scroll down the page and view the video below. It's impressive how little the brushes blow in the wind. Whats also impressive is the lack of drag that the Towtector puts on airflow compared to standard flaps. Brand new adjustable height Towtector allows for movement in the center hub. This allows for use with multiple vehicles. Towtector accessories include: Replacement brush strips, ball mounts, receiver locks, anti-rattle kits and the famous Towtector heat shield! Towtector easily clamps directly to your ball mounting using a center tube mount and heavy duty bolt. Check to see that you have a minimum of 1.25" of space on your ball mount for this section to fit well. If not, a longer ball mount will be necessary. We recommend hanging the Towtector system a minimum of 3" to 4" from the ground. This space allows for proper airflow and to protect against drag when reversing your vehicle. Learn more about this brush system from the attached videos located under the Aluminum, Premium, Pro and Chrome Towtector sections. Protecting your boat and trailer should be a big priority in your setup. If you have any questions give us a call! We love talking mud flaps and are more than happy to give you more information about this system. If you need help finding the right height brush strips for your Towtector simply watch the video below. It's really simple: Measure the distance from the ground to the top of your receiver and subtract 2". For example: If you measure 18" to the top of your receiver then you need a Towtector with 16" brushes. Its that easy! Don't worry, if you need help call us at 1-720-242-7322 for more information!